The start/finish for the XC and cyclocross races was on the racetrack. Short Track- Had a crappy start (completely my own fault), chased back up to leaders, had a mechanical with 2 laps to go, caught up to 4th and 5th, lost sprint and ended up 6th. Happy with legs. 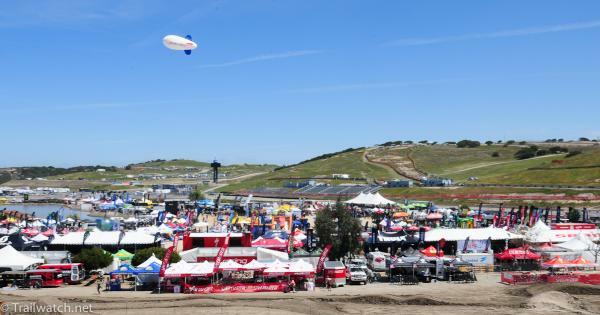 Cyclocross- Yes, cyclocross at Sea Otter. They did a great job putting together a spectator-friendly course but only 7 women showed up. Luckily there were more than 7 drunk people cheering us on. Luna went 1-2-3: I won, and Teal and Katerina finished 2nd and 3rd. 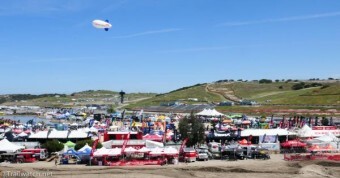 The Sea Otter Classic is a unique event. Since I have been a professional racer, I think have only missed it once out of the past 9 years. (Wow, that just made me feel old…) It’s the kind of race you either love or you hate. I love it. It’s probably the biggest cycling festival we have in the US, and it’s the only place other than Interbike where we can catch up with sponsors and others in the industry that we don’t see all year. There are tons of racers, it’s in a beautiful area, and the weather is usually pretty nice. (Usually). The course has changed over the years: we used to race 2 big 18-mile laps, then we moved to a shorter multi-lap course for a few years, and this year it was one 20-mile lap. 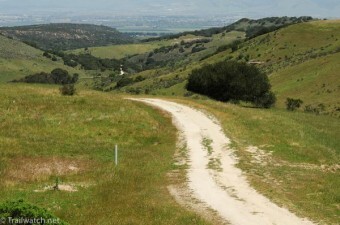 The race starts on pavement, but the lap is about 50-50 fire roads and single-track. It’s pretty sandy and by the time we race so many riders have been on the trails that they are pretty choppy and rutted. We arrived in Monterey on Wednesday night after a day traveling from London. On Thursday I was scheduled to do a ride with Mavic (our wheel sponsor) because they were launching their new 29er wheelset. Zak had a slick-looking Alma 29er built up for me when I arrived at the venue, and I jumped on and rolled out with some photographers and media who were also trying out the new wheels. I tried a 29er a few years ago and I liked it in certain conditions, but there were some times when I preferred the more nimble handling of the 26er. Ultimately, I stuck with the 26 and I haven’t really ridden a 29er since then. 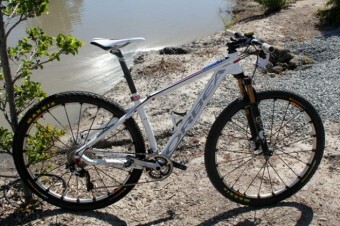 The bike felt great, handled well and seemed to smooth out some of bumps and ruts on the course. Wait a minute- did I just drink the Kool-Aid? My pre-ride finished on the short track course, and I thought that maybe this was the perfect bike for the short track. I would wait until the morning to decide- I would take both bikes out to do a lap back to back. So that’s what I did, and it was no contest- the 29er felt less harsh on the bumpy short track course, so I figured I’d give it a go. Short track. My legs weren’t feeling particularly snappy the morning of the short track. The combination of travel and jet lag weren’t really working in my favor. But if there is one way to shock your system and clear the junk out of your legs, it’s short track. You’re going to suffer no matter what, so you might as well get the crap out of your legs too, right? The course was very similar to years past- bumpy grass with a couple punchy climbs and a fast descent. I got the world’s worst start (despite my front row call-up) and was back in the teens halfway through the first lap. I moved up slowly, picking people off one by one. I was closing down gaps like crazy on the fast descent- lots of women were just coasting, but I was pedaling and it helped me pick off a few more riders. I was surprised and pleased that my legs felt as good as they did considering how they felt in the warm-up. Eventually I caught up to Katerina, Catharine and Lea- the lead group that had a gap on the rest of the field. We had about 4 laps to go at that point, and I was glad that I had a few laps to recover before they started attacking with one or two laps to go. Then, on the fast downhill, I looked down to see I had dropped my chain. I slowed a little and tried pedaling gently to get it back on, but I realized that it was wedged between the small chainring and the frame. I stopped and tried to be as calm as possible as I unlodged the chain and put it back on, but I felt like I was losing tons and tons of time. I got going again just as Heather and Eva passed me on the downhill. As I came through the start finish I had 2-to-go as I tried to reel in 4th and 5th place and salvage a spot on the podium. With 1-to-go I made contact, but I didn’t have enough of a punch to make it around them on the climb. We came together for a sprint finish and I ended up 6th. Oh well, at least I felt good. Cross Country. Having good legs in the short track gave me a little confidence boost heading into the XC. And since I enjoyed it so much the day before, I ended up riding the 29er again (ok, I guess it was more than a sip of the kool-aid…). The start was nice and mellow- no one was acting crazy as we rode in a pack for a mile on pavement before we hit the dirt. As we came to the turn-off, the pace quickened as everyone jockeyed for position heading onto the dirt road. Catharine went to the front, but I went around her soon after- I knew there was a rutted downhill up ahead, and I wanted a clear shot at it. Everyone seemed content to sit behind me as we rode the rolling fire road, and I was first into the first section of singletrack. I tried to ride smoothly because it’s easy to over-cook those sandy corners. I stayed in front for the next singletrack climb, but I knew there was a good-sized group strung out right behind me. At the top of the climb, Catharine came around me, said that we had a gap and punched it over the next hill. I jumped on her wheel and glanced back to see Katerina a few seconds back. I figured she would catch up on the downhill. At the bottom of the downhill, Catharine and I were still together and we took turns pulling on the flat fire road sections before the feed zone. After the feed zone we took turns at the front, and we seemed pretty equally matched. I wasn’t sure if she was saving something, so I figured I should probably try a little attack early rather than waiting until the last climb. I punched it over one of the rollers before a singletrack section, got a little gap and just tried to ride the singletrack as smoothly as possible. My little attacked worked and I was by myself as I started the long climb back to the finish. I have to admit, I was a little emotional crossing the finish line. 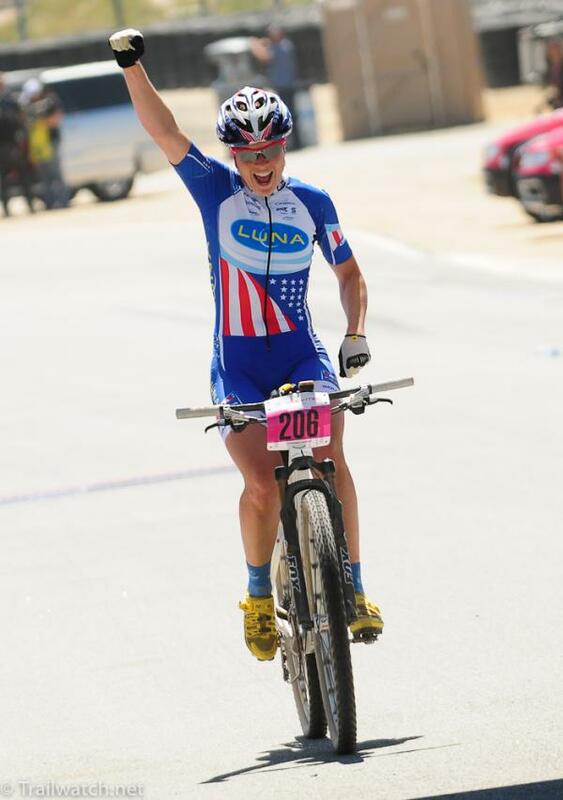 The last few months have been full of ups and downs, and it was such a relief to be back at the front of a bike race! I was thrilled. After the race, I had just enough time to shower, change and hang out for about an hour before getting back in a chamois for the cyclocross race. Finally! Another step in the right direction. Yes, you heard me, the CYCLOCROSS race. 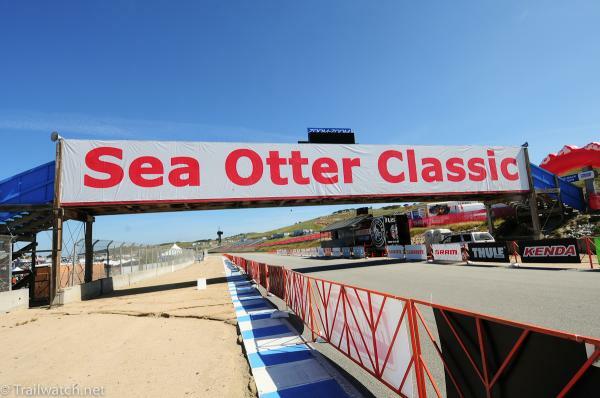 This year was the first year the Sea Otter had a cyclocross race and since our team LOVES cyclocross any time of year, we all signed up. I had no idea what the course would be like, but I was pleasantly surprised by the course they put together- there were some long straightaways, 2 sets of barriers, a couple short uphills, some technical corners, a gravel pit and a run-up. Yep, they pretty much had anything you could want in a cross race. The course also went through the expo area, and there were a set of barriers right next to the food and beer tents. There were only 7 of us registered, so the officials decided to shorten our race which was fine with us, since most of us had already raced the XC earlier. At the start line, a couple drunk guys asked if I would like some beer. Oh, what the heck, why not? I took a swig and thanked him. It was actually pretty good beer, so when he offered again I couldn’t refuse… Then he asked me if I would like a “salad feed” during the race. A salad feed? Was he kidding? “How about a DONUT feed,” I said, “or a BACON feed.” “Well, they aren’t giving donuts away free at the Clif Bar booth, but they are giving away free salad.” I laughed and had another swig of beer. Needless to say, when the race started and Teal went to the front and pinned it, I was suffering a bit… “Teal, you are killing me!” I yelled at her as I tried not to get dropped. The three of us quickly separated from the rest of the field, and Teal finally eased up a bit. But then Katerina went to the front and punched it. Clearly, we were not going to make this easy on each other. Just before one lap to go, I saw a hand dart out into the course. The hand was full of…salad. I had to take it. I shoved the salad in my mouth. It was…surprisingly well-dressed (nice job, Clif Bar). Katerina was on my wheel and I told her, “I just took a salad feed!” She said, “is it all stuck in your teeth?” It was, and I just turned around and smiled at her. On the last lap, Katerina crashed in a loose corner and Teal and I went around her (after making sure she was ok, of course). I managed to put in a good hard effort and rolled in a few seconds ahead of Teal who finished second and Katerina followed a few seconds later. It was a really fun race, and even though it was kind of tough doing 2 races in one day, I think it was worth it if it introduces more people to ‘cross. 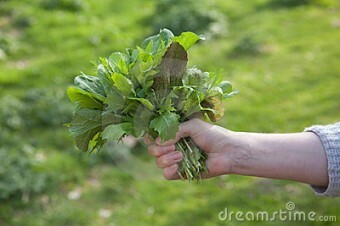 The handful of salad I was offered looked...messier. Now I am home for a few days before heading down to Prescott, AZ for the Whiskey 50: a 50-mile mountain bike race that I have heard rave reviews about.